Kia UK has released pricing of the Soul crossover. Arriving in 5 trim-levels, the new Soul will start from £10,495 rising to £14,995. Entry-level Soul 1 comes equipped with chrome grille, piano black high-gloss a-pillars, black front and rear bumper insert, black door handles & mirrors, tinted glass, RDS radio + CD player with MP3 capability and 6 speakers, USB & AUX ports, front variable intermittent wipers with rear single speed wiper, black bezel headlamps with headlamp levelling device, high mounted stop lamp, air conditioning, x4 electric windows w/auto down driver's side, external temperature display, x6 airbags (twin front, side and curtain), active front headrests, ABS, EBD & ESP w/ traction control and BAS, remote central locking with 3 button folding key, deadlocks, 15" front and 14" rear disc brakes, engine immobiliser, ISOFIX, 60/40 split folding rear seats, tilt adjustable steering wheel, black cloth upholstery, front cupholders and a glovebox. 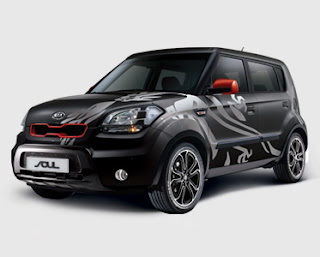 Soul 2 adds body coloured door handles & mirrors, tinted windows with shadeband, leather steering wheel & gearshift w/ steering wheel mounted audio controls, front fog lamps, iPod cable, electrically adjustable door mirrors and seat back pockets. Soul Samba adds piano black high-gloss bumper inserts (front & rear) & door mirrors with heated function, chrome door handles, privacy glass, rear spoiler, dash-top centre speaker with external amplifier, sub-woofer speaker (located in luggage area) w/ mood reflecting front speaker lamps (4 settings - On/Off/Mood/Music) and reversing sensors. Soul Shaker adds body coloured door handles & mirrors, auto-dimming rearview mirror with reversing camera and electric sunroof. Soul Burner adds chrome door handles, metallic paint, Torando Red door mirrors and roof rails (excluding auto-dimming rearview mirror with reversing camera and electric sunroof). 340 litres of luggage space is provided, going upto 800 litres with the rear seats folded. Souls with luggage underfloor tray have 222 litres with seats upright and 700 litres with seats folded. CO2 emissions are rated at 153g/km for the 1.6 litre CVVT petrol manual, 137g/km for the 1.6 CRDi manual and 155g/km with the latter and a automatic transmission. Metallic paint is a £365 option. Kia aims to sell 3,500 units yearly. Sales start on Sunday 8th March. Based from the car description, it is a kind of car that has the quality performance but we can't assure if some customer can afford to buy it. Is there any discount granted for the buyers even a little?